Have you tried our cozy new Fleece yet? 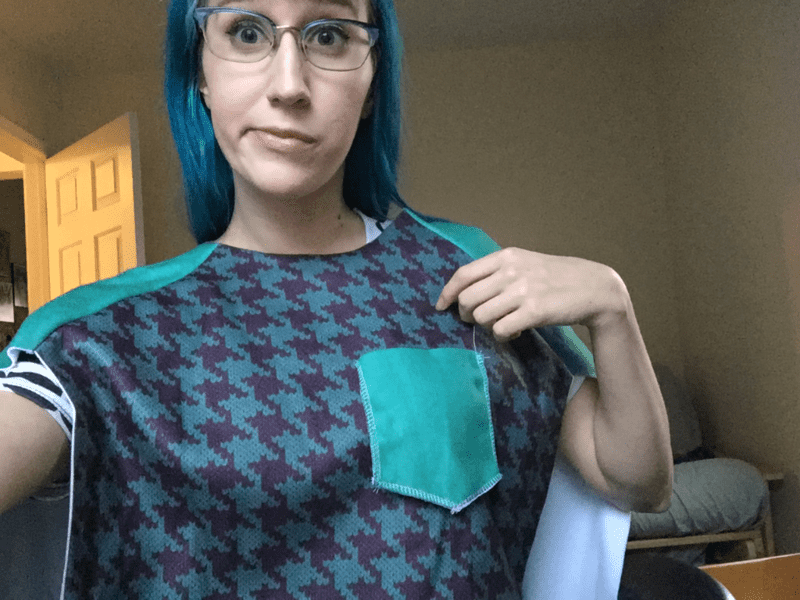 Operations Supervisor Paula stops by the blog to share her experience sewing up a Lane Raglan tee by Hey June Handmade with our versatile new fabric. 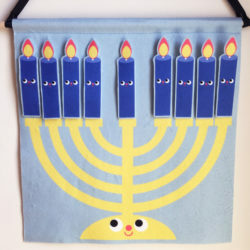 Who has time to print, cut, tape and pin a PDF or paper pattern? Ain’t nobody got time for that! 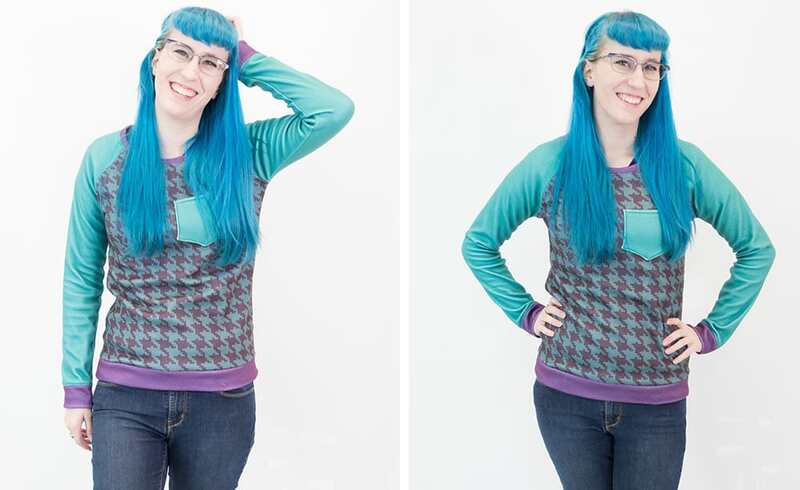 Paula used Sprout Patterns to sew up a soft, comfy Raglan tee in record time. Check out her pro tips and see how easy it is to sew your own! 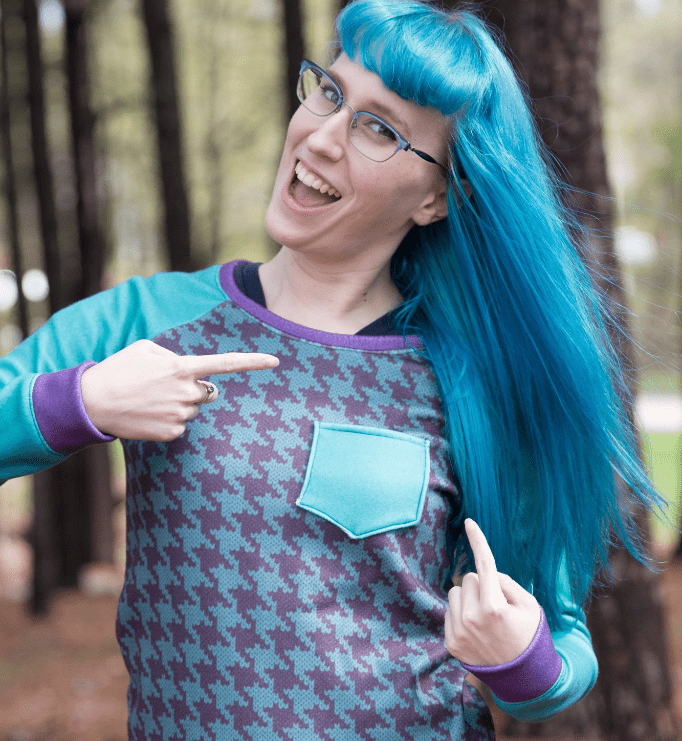 Paula: I have never fallen for a pattern quite as quickly as I did for the Lane Raglan. It’s only March but (including this one) I’ve already made three of them this year. 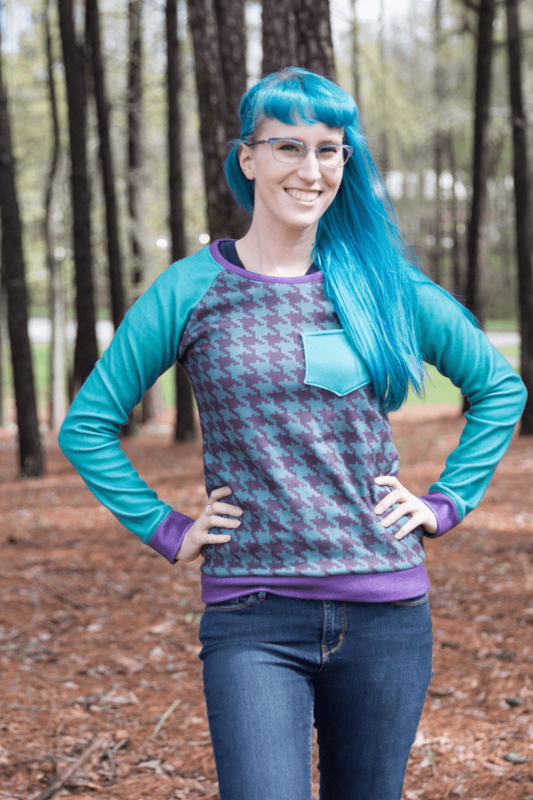 It’s a quick pattern to sew and can be made with a variety of fabric weights to give you a nice regular shirt (if you use Modern Jersey or Cotton Spandex Jersey) or now you can use our brand new Fleece to make a cozy sweatshirt! Just how cozy is this new Fleece you ask? I would describe wearing this sweatshirt as getting an eternal hug from my best friend. It’s just so nice and comfortable. 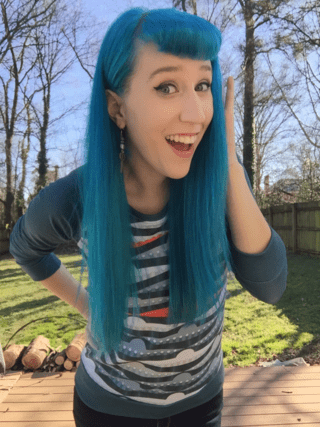 I made the shirt using Sprout Patterns – which allows you to choose designs from Spoonflower’s Marketplace (or use your own design) and choose which designs you want for certain pieces of the pattern. 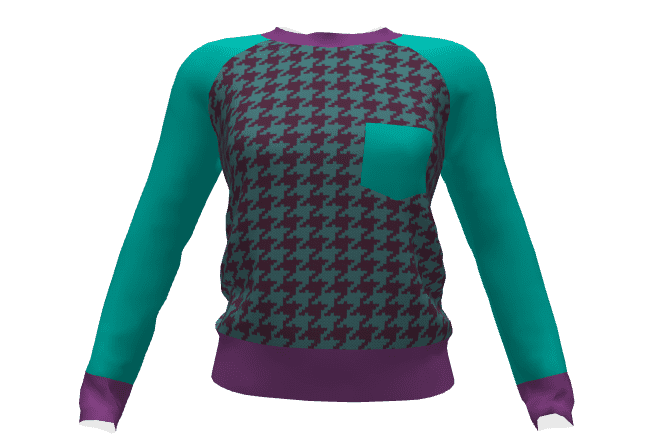 I used Retro Modern Houndstooth knit in Blue and Purple by kcretcher, Solid dark teal by brendazapotosky, and Shema No 1 Imperial Purple by winterblossom, all from the Spoonflower Marketplace. And if you want to be twins with me, it’s available as a public project on Sprout here. If you want to almost be twins with me, Sprout makes it really easy to start with a public project and move the designs around or choose other contrasting fabrics with their “copy & customize” button. Want this same sweatshirt but with a purple pocket? Your dreams can be realized! Sprout Patterns creates a 3D preview of your project in real-time as you create it. 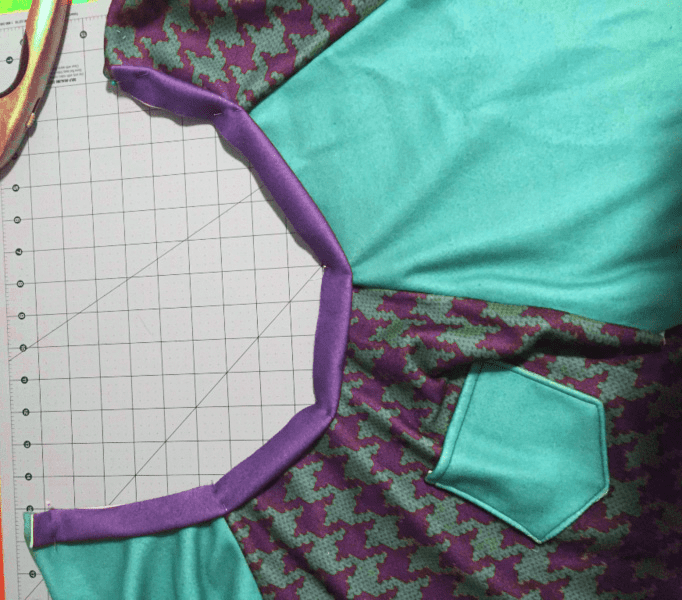 You can adjust and position the design on the pattern until it looks just right! 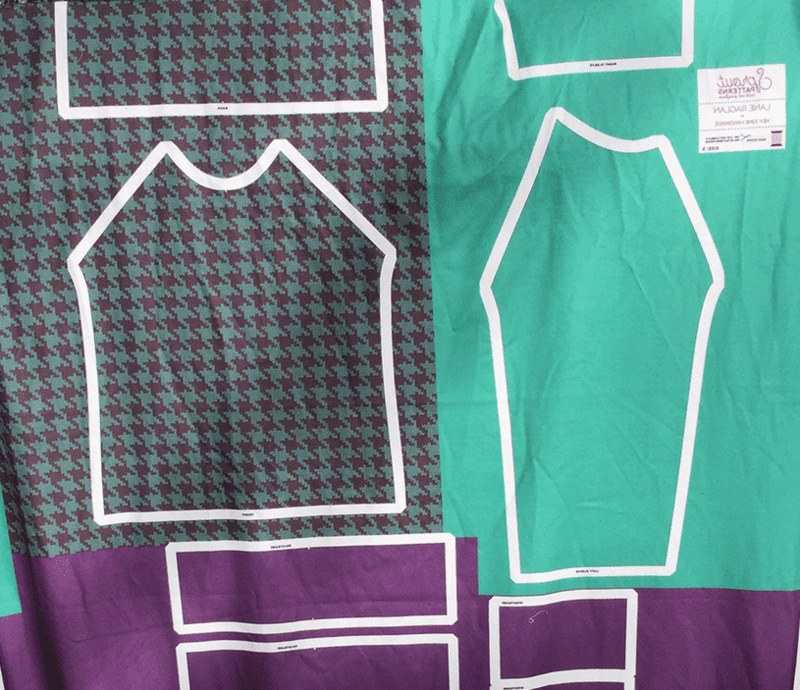 The great thing about Sprout is that I’m a lazy seamstress… and Sprout replaces a lot of tedious parts of sewing for me, such as cutting out the paper pattern and then tracing it onto the fabric. Even though I’m essentially doing the same thing as fussy cutting- using the 3d models on the Sprout website to place the design onto my pattern is fun and sometime I find myself sitting and playing with potential projects for far too long… oops. 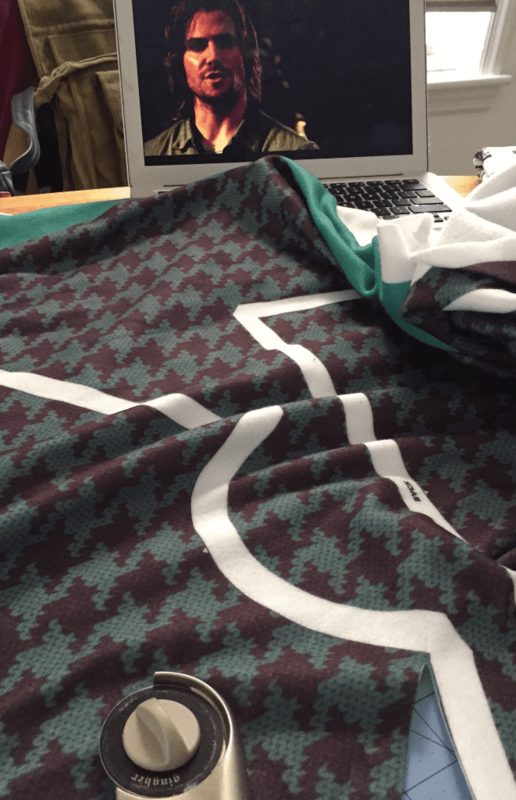 So once I had my fabric printed and pre-washed, the hardest decision I had to make (and most time consuming part of my sewing project) was what TV show I was going to have on in the background while I was sewing. 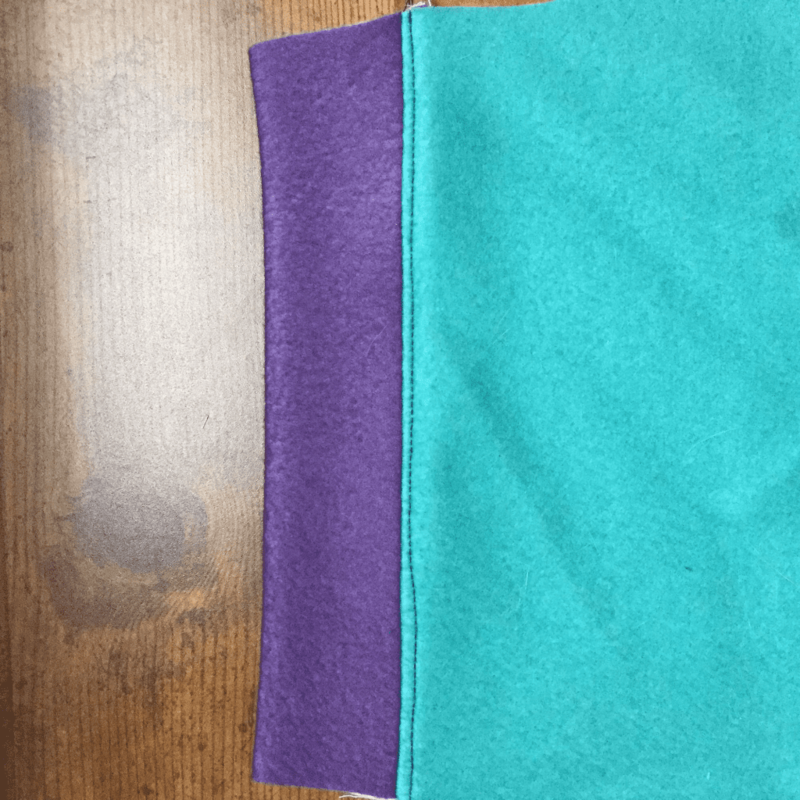 If this is your first time sewing a Lane Raglan and working with our Fleece, here are some things I’ve learned after doing both a few times. Use a walking foot! I don’t know how I went so long without one of these. I never even heard of them before I tried my hand at quilting a few years ago. And now I hardly ever take it off of my sewing machine. 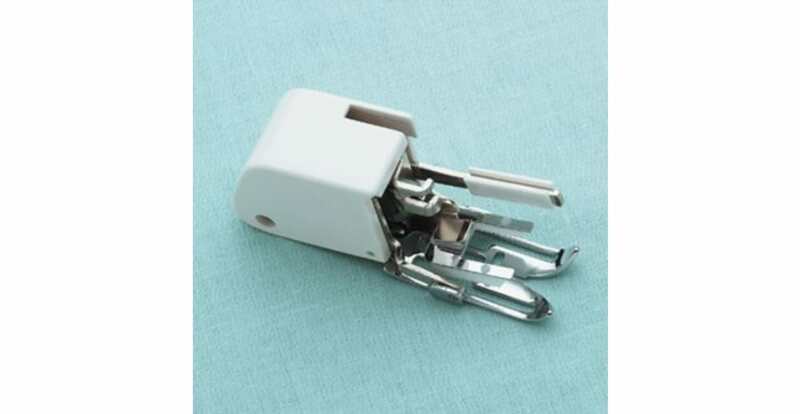 A walking foot adds feed dogs to the top of your sewing too- so everything feeds in smoothly. It is helpful when you are working with any knit to avoid the crazy waviness that can form- but it is particularly helpful with fleece which is a knit and can be a bit bulky- the walking foot makes sure that nothing bunches up. 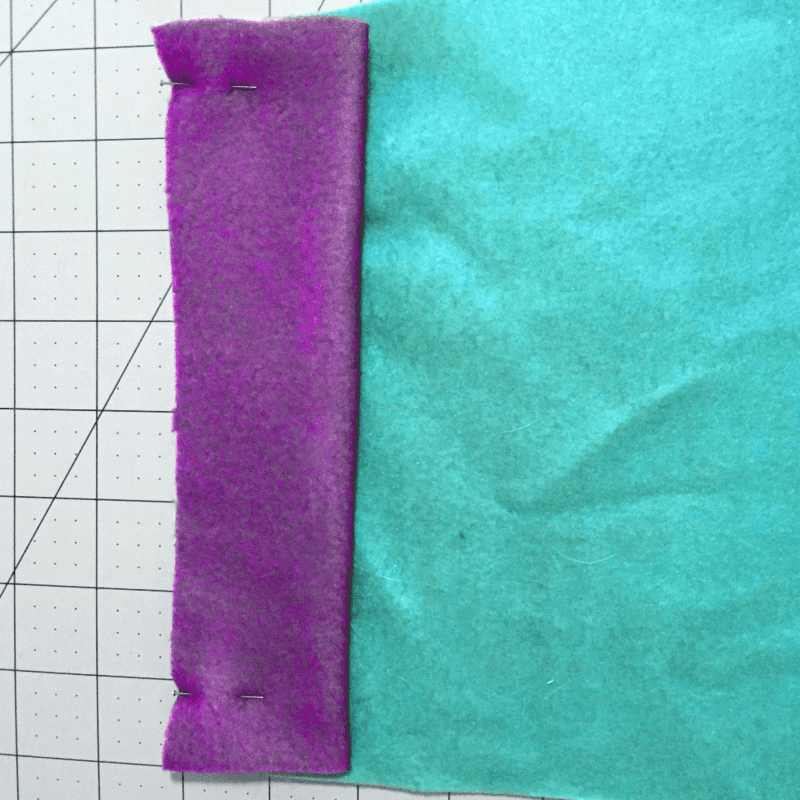 I’ve used the walking foot for the few fleece projects I’ve had a chance to make and I have not had a single problem sewing it at all! Yea! Use a serger or overlock stitch to finish your seams- this one may be personal preference… but… I’ll suggest it anyway. Since Fleece is a knit it’s not going to fray on you. 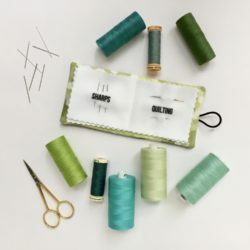 But finishing your seams with a serger will give you a really nice professional quality in your finished garment — and isn’t that what we all want in the end? The Lane Raglan is a really quick project- it took me about 3 episodes of my TV show (which is Arrow!) from the start of cutting to trying it on as a final project. And that was only because I kept getting caught up in my favorite character’s backstory and forgetting to sew… If you are a skilled sewer, you probably don’t need to read the directions (I kind of fumbled my way through the first one and it turned out totally fine—no extra sleeves or anything!) but they are included in your Sprout purchase just in case you are a more disciplined seamstress than me and actually read instructions. Sew your bands and cuffs flat. I do this for every t-shirt I make. It makes life SO MUCH EASIER. So instead of sewing together your neck hole / sewing the seams on your sleeves / sewing the sides seams of your shirt, keep them open and sew the cuff/band onto them first. Pros of this: It’s fast! Additionally, you don’t have to try and stretch the bands/cuffs to fit perfectly in the circle of the hole you’re trying to work on. And you can do some nice top-stitching while the project is flat to sew down the seam. Cons of this: you get a tiny bit of visible seam when you do sew all of your pieces together. Serge the sides of your pockets: This one might seem a little weird, but the first time I made this shirt I gave up on the pocket because I couldn’t get the tiny amount of fabric folded over and pinned. It ended up looking wonky and I ripped it off. 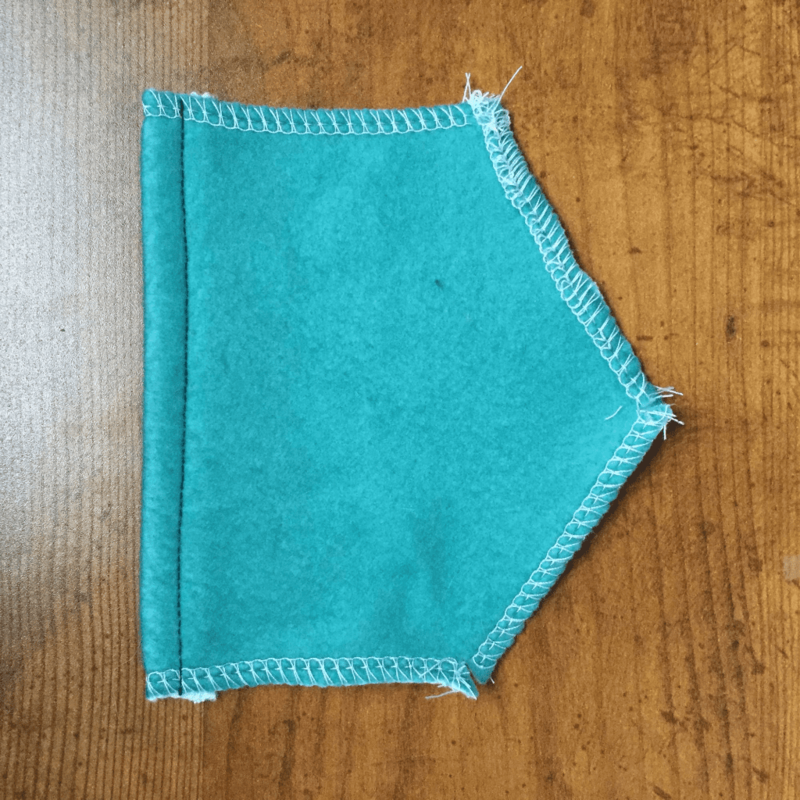 Serging the sides of the pockets before you sew it on helps give you a little bit of extra bulk and a guide to help you feel where you should sew. Once you serge the sides you can turn the top down 1/2″ and sew a nice line of top stitching. If you find yourself at home alone & can’t quite get the pocket placement right, phone cameras are great helpers for fussing with getting everything straight. Put it on! Look so good! I hope you find all of these tips helpful! 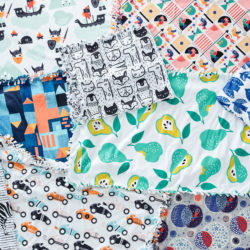 Enjoy sewing with your brand new cozy Fleece and your customized Sprout Patterns project! 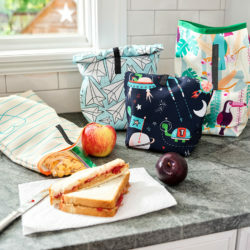 Paula is a managing supervisor in Operations at Spoonflower. When she’s not actively trying to photobomb every picture being taken at work or finding where all the candy stashes are, she can be found at home snuggling with her corgi mutts, reading a book, or attempting to keep up a personal sewing blog (lilblueseamstress). She is cute. I like to see a person having fun and not being too serious. i sew for fun,so I like to see that emotion reflected in others.